Ideal for all professional-grade gluing needs, Grizzly Glues create solid bonds on wood, glass, tile, stone, and metal. Grizzly Glues are polyurethane adhesives, excellent for all interior and exterior applications except gap-filling bonds where structural integrity is a factor. They can be used with a wide variety of materials and are specially formulated for deep penetration and difficult gluing projects – projects that can’t be done with other adhesives. Grizzly Glues are engineered to bond any 2 materials as long as one of them is porous (e.g. wood to wood, glass to wood, stone to bronze). Test these materials in advance to determine if the desired joint strength is present. 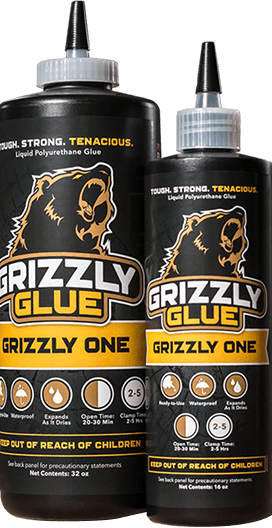 Because of their foaming action and easy sanding quality, Grizzly Glues won’t leave behind a permanent glue line. However, Grizzly Glues should not be used where strength is needed in gaps that appear in load-bearing or on stressed structures such as laminated beams. Grizzly Structan – a cartridge-loaded polyurethane adhesive – is tougher than liquid polyurethane glues, making it perfect for wood, stone, tile, metal, glass and other applications that require a professional-strength bond. Created for professional, commercial, and industrial applications, it’s designed to withstand whatever nature can dish out, yet it’s cost-effective and easy to use. What makes Grizzly Structan a stand-out in the realm of polyurethane adhesives? Grizzly Xpress, a cartridge-loaded thixotropic (semi-gel) polyurethane adhesive, is strong, yet bonds quickly. It’s gel formula is great for wood, stone, tile, metal, glass and other applications which need a professional-strength bond and need it fast!